While packing for New York last month, I was faced with a bit of a challenge: I wanted to bring everything I needed, but had to make sure I’d still be able to handle my luggage on my own (it was my first time traveling independently, and honestly I am kind of weak). Since I was bringing a ridiculous amount of clothing with me for fashion week, I needed to pare down on the toiletries. Make up-wise, I wanted to make sure I wasn’t lugging around my entire up collection, while still having everything I wanted to look fully put together. Here’s are some tricks on what I did to minimize; some of these products have been used since the last time I did a make up related post (here), but I’ve also found many new favourites since! Concealer (this is my new HG!) 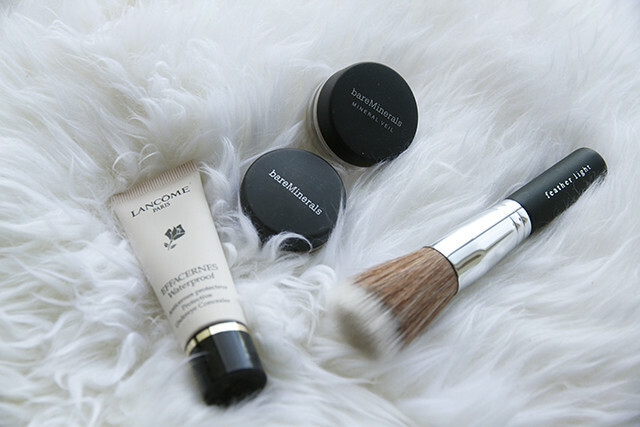 to hide tired eyes and blemishes, bronzer and a powder (with SPF!) to keep things natural and fresh. 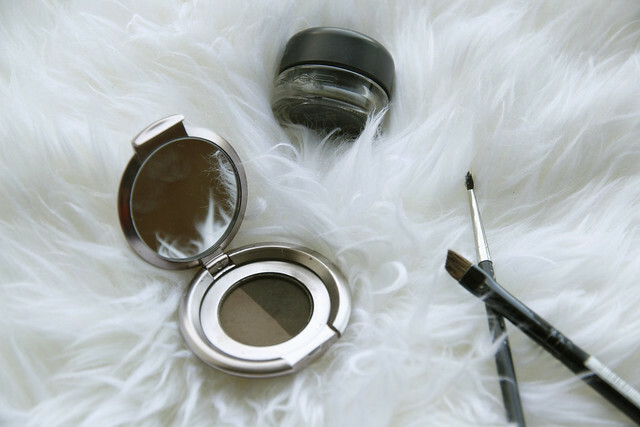 A great brow powder that also doubles up as an eyeliner for daytime, and a no-budge gel eyeliner to amplify a look come nighttime. Prior to NYC, I indulged in eyelash extensions at Wink in Vancouver, and it proved to be a great payoff! It minimized my routine time, I got to bring less and I also looked more awake during my flight and when I woke up. I am still enjoying them over a month later. Oatmeal is still my favourite cleanser (see here for full post) and I love that it’s easily disposable. I also bring trial sized versions of eye make up remover and my favourite toner (along with q-tips and cotton pads in a Ziploc). Additionally, I use sample moisturizers, usually from Kiehl’s, because they take up virtually no space. Unless you have very sensitive skin that needs specific products, I think it’s the best way to go. I hope this will be useful for you the next time you travel! 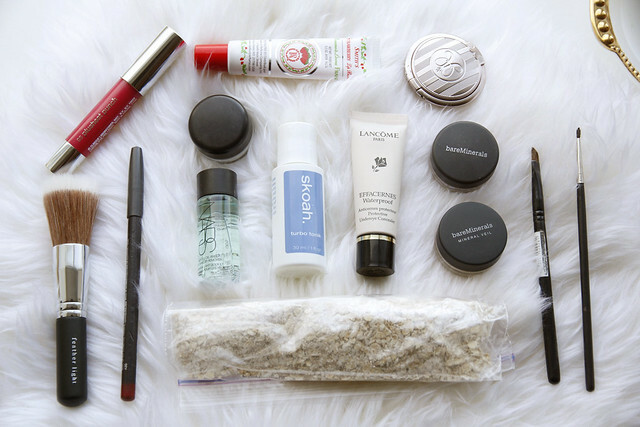 What does your travel beauty routine look like? 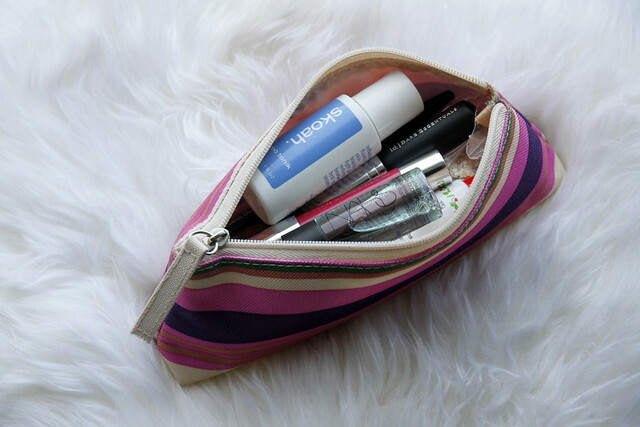 I LOVE the Clinique Chubby Stick Intense – that would definitely come with me too in my travel makeup bag! I have Chunkiest Chilli and Curviest Caramel and wear them both all the time. I’ve heard loads of good things about that Anastasia brow powder – it looks like it works really well. I can’t believe all that fit in that little bag! I need you to come pack for me! love this post, I have been getting a bit beauty obsessed lately and love to have the best basics in my make up bag for travelling! 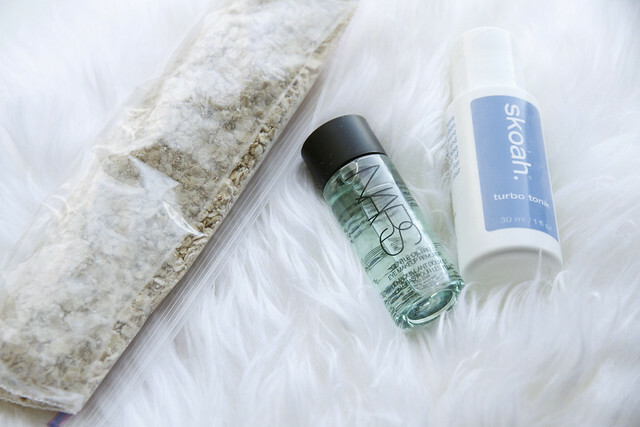 Can u review the skoah toner! I really want to try that clinique lipstick! Very efficient! I’ve minimized my makeup routine as well – basically just need my fav foundation, lip color, and an eye pencil! I’m a makeup and beauty junky so I could never travel this light. Kudos to you! That MAC in brick is my favorite! Despite being a beauty junkie, I actually travel very light. Usually it’s two moisturizers (one with SPF), mascara, concealer, liquid liner, and a cream blush. If I know I’m any special events are involved, I’ll bring my Urban Decay Naked palette, tinted moisturizer, and a few brushes. Easy looks that can be removed with soap and water. Some of my cosmetics and brushes run very pricey, so I don’t generally feel comfortable taking them with me on trips in case they get lost. I enjoyed reading this post along with the photos! I also reside in Vancouver, where’s your favourite place to shoot? I wish I could pack like that! Super impressive!